Now available for Silver tier drivers! In conjunction with Better365, Grab has partnered with Petronas to help reduce the driving cost of our driver-partners. Since then, we have continued to expand the programme to provide more benefits to our GrabAllStars driver-partners. Now, we are proud to introduce the all-new Grab Mesra Fuel Savers Programme, available for Silver, Gold & Platinum driver-partners on the GrabAllStars platform. Earn MORE points and fuel rebates whenever you fuel up at Petronas stations nationwide! Meet the following minimum monthly spendings to receive points credited into your Mesra Card by the 15th of the following month! All Grab Drivers who are Silver, Gold and Platinum status in GrabAllStars programme are all entitled to opt-in for the programme. Your current tier for the month will determine the points rebate for the following month. Q: What do I need to do to qualify for the Grab Mesra Fuel Savers Programme Rebate? A: All driver-partners who are Silver, Gold and Platinum status in GrabAllStars programme are entitled to opt-in for the programme to claim the bonus points. Additionally, driver-partners would need to spend a minimum of RM300 or RM600 to be entitled for the points rebate the following month. Q: I don’t have a Mesra Card. Where can I get a Mesra Card? A: Visit any PETRONAS station to sign up for a general Mesra card. Q: What do I need to do to be entitled for the points rebate ? A: Driver-partners MUST swipe their Kad Mesra everytime they pump or spend in Kedai Mesra. Once you hit the minimum spend of RM300 or RM600, your points rebate will automatically be credited into your Kad Mesra points balance in the following month..
Q: Does the programme have any restrictions on the type of fuel or purchases that I can make? A: No, purchases include fuel and non-fuel purchases except top ups, cigarettes and non-points issuance items. Q: Can I use the Mesra points to purchase other items in the service stations or only fuel? A: Driver-partners may spend their Mesra points on both fuel and purchases at Kedai Mesra. Q: Which Petronas stations are in this Fuel Savers Programme ? A: ALL Petronas stations nationwide. Q: What happens if I forget to swipe my card during purchase? Can I still have points added later on? A: If you forgot to swipe your card, you will not be able to claim your points later on. Q: When will the point rebates be credited to my Mesra Card account? A: The point rebates will be credited monthly into your Mesra Card by the 15th of each following month. For example, if you spend RM 600 and above between 1st til 31st December 2017, you will receive a rebate of 2,200 Mesra points (Gold / Platinum tier) that will be credited into your Mesra Card by 15th January 2018. Q: If I have opted in on the 10th of January, when will my spend period be? 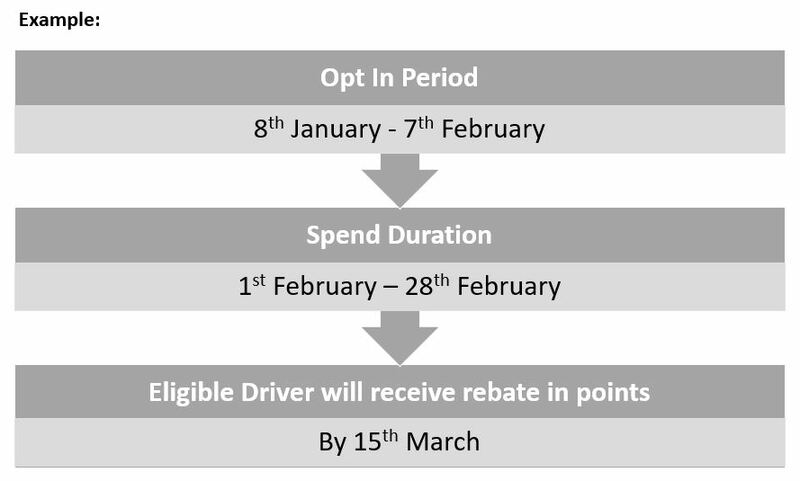 A: Your spend period will be on 1st February – 28th February. For example, you can qualify for the current month’s spend period if you opt in by the 1st of the month, otherwise your spend period would begin at the start of the following month. Q: I have received a 6x Grab Mesra Card, what should I do with my existing general Mesra Card and its points? A: Driver-partners may call PETRONAS Mesra Link Call Centre, 1 300 22 8888, to replace your existing Mesra points to your new 6x Grab Mesra Card account (all points will be transferred to new 6x Grab Mesra Card while the old general Mesra Card will be deactivated). Meanwhile, we will register your new 6x Grab Mesra Card for the Fuel Savers programme and combine the spending for both cards. Q: I am a driver but I do not have a Mesra Card. Where can I get it? A: Driver-partners can visit any PETRONAS station to sign up for a general Mesra Card. Q: How can I get the exclusive 6x Grab Mesra Card? A: 6x Grab Mesra Card is an exclusive limited-edition card which is distributed periodically to selected top Gold / Platinum Driver-Partners with above 200 completed trips per month for 2 consecutive months (2 months in a row). Note: The Grab Mesra Fuel Savers Programme does not give out 6x points.